Over the years Serie A, affectionately known as “Calcio” by its fans and followers, has played host to some of the world’s greatest names, its most dominating teams and astute managers. Picking an XI that encompasses the entire history of a league from a country that has won the World Cup four times and the Champions League/European Cup 12 times is an astonishingly difficult feat, and there were some difficult omissions. However, I’ve tried to be as all-encompassing as possible – the temptation to dip into the Serie A glory days of my own personal memories were great, but there were more worthy names from earlier generations that could not be ignored. Anyway, without further ado – here is the line-up. Remember, this is completely subjective and just my opinion – so feel free to discuss and debate with me on Twitter @SamCalcio. Pre-note: Despite its relatively modern arrival into the world of tactics, I went with the 4-2-3-1. I did this for two reasons: 1) I needed a back four, as a Serie A XI without at least four defensive players is wrong on several levels and 2) It allowed me to put five attacking players on it, including four vintage #10’s. It just made sense. Italian football historians will claim fellow Juventus legend Dino Zoff is the deserved candidate for the #1 jersey for his longevity and clean sheet record, but the fact remains that Gianluigi Buffon is the most complete goalkeeper in Italian football history and arguably the greatest of all time. Making his Parma debut at the age of just 17(an achievement in itself in the notoriously veteran-dependant Serie A), Buffon was named Serie A’s Goalkeeper of the Year before he turned 23 as a stalwart in Carlo Ancelotti’s exciting Parma side, featuring fellow future Juventus stars Fabio Cannavaro and Lillian Thuram. 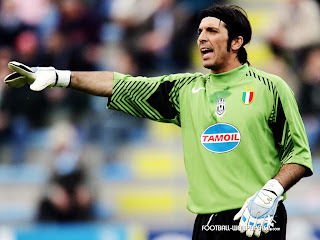 A move to Juventus in 2001 for a still record fee(for a goalkeeper) of £32.1m was immediately justified as Buffon won consecutive league titles in his first two years. A World Cup win followed while only conceding two goals(not including penalty shoot-outs) along the way, and only one from open play (which wasn’t even scored by the opposition, Christian Zaccardo’s own goal against the USA responsible for that). The other goal? A chipped penalty from Zinedine Zidane in the final. Buffon affirmed his legendary status in the hearts of Juventus fans when he opted to stay with his ailed club during their spell in Serie B after the Calciopoli scandal, and fought back from a back injury in 2010 to win his 9th Serie A GKOTY award in 13 years in 2012. Buffon’s agility, athleticism put him over the less mobile Zoff, and dons the #1 jersey in this XI. Honourable Mentions: Dino Zoff, Walter Zenga. I know what you’re thinking. Paolo Maldini, world’s greatest left-back, at right back? Well, yes. It seems a strange decision on the face of it until you find out that the Rossoneri stalwart was naturally right-footed, and played as a right winger up until breaking into the Milan first team at just 17. While it’s not ideal, because of the guy I’ve got at LB, this became a necessity. Selected by then Milan manager Nils Liedholm after a second half injury to Sergio Battistini in 1985, young Paolo impressed the Swede with his composure and was given a starting berth the following season. Since then, Maldini was never taken out of Milan’s team, forming a key part of arguably football’s greatest ever modern club side when Arrigo Sacchi took over in 1987. The victories came quickly and never really stopped, winning his first Scudetto of seven in 1988, and his first European Cup of five in 1989. 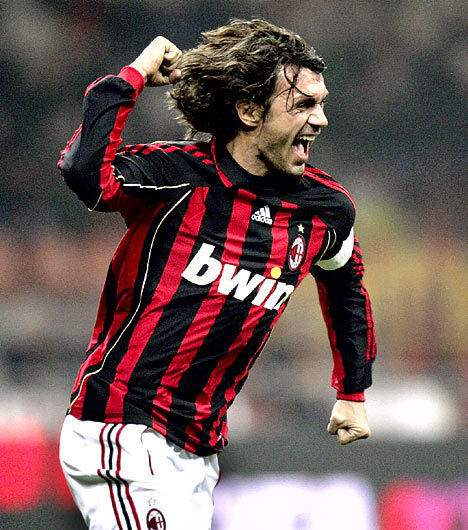 Blessed with composure, intelligence and technique that contradicted his position in defence, Maldini’s skill allowed him to have an almost inhumanly long career at the highest level, retiring from football in 2009 after nearly 24 years and 25 major trophies. AC Milan retired the famous #3 until such time that Paolo’s children break into Milan’s first XI(note: they’re in the youth teams), and if they’re half as good as their father (or even their European Cup winning Grandfather Cesare) then Milan have much more to look forward to from the Maldini family. Honourable Mentions: Mauro Tassotti, Cafu. Another Rossoneri legend whose number has been kept back by his club, only this time there is no chance that anyone will wear the #6 again, and appropriately so. In a league dominated by great defenders, Franco Baresi was probably the easiest choice in this entire team. Despite Franco’s less than imposing physical stature (his 5’9 frame leading to fans calling Baresi “Piscinin”, Milanese for “little one”) Baresi neutralised attacking threats by playing as the last man of the defence, solely responsible for the offside trap and utilising positional awareness and timing to catch out strikers. Baresi won 10 league titles and three European Cups throughout a 20 year career as arguably the best player on a team that contained Marco Van Basten, Ruud Gullit and Paolo Maldini, famously captaining Italy to the World Cup final in 1994, playing 120 minutes in the sweltering Pasadena heat at the age of 34 with a knee injury he sustained earlier in the competition. Probably the most intelligent defender to have ever played. Honourable Mentions: Fabio Cannavaro, Armando Picchi. The quiet leader of the Juventus defence that was more famous for partner Claudio Gentile’s notorious antics, Scirea was the key cog in a Bianconeri backline that set the example for the rest of Serie A during the entirety of his Juventus career. The Italian answer to Franz Beckenbauer, Sciera was famous for taking the ball out of defence, forming an extra part to the midfield and even joining in up front – scoring 24 goals in the process for Juve during a 14 year spell with the Old Lady. Like his defensive accomplices, Scirea was a serial winner – seven league titles in 14 seasons and a World Cup for Italy in 1982 emphasises the totality of his success. A quiet individual whose unique sportsmanship set him apart from his rivals for this spot in the line-up, his red-cardless career emphasise Scirea’s placidity and sportsmanship in an footballing era that was often famous for little of either. Honourable Mentions: Claudio Gentile, Alessandro Nesta. The first attacking full back of the game, a man whose revolutionary style of playing changed the way wide-defenders played the game and defined Inter’s greatest ever team. Facchetti began his career at Inter in 1960, instantly impressing charismatic tactician Helenio Herrera who placed the then striker as full back, inviting him to push forward despite his field position. The plan worked to perfection, as Facchetti was one of the main reasons why Herrera’s catenaccio style was so effective. His stamina allowed him to patrol the by-line with pace and strength while his forward strides made for an effective counter-attacking weapon. The complete defender, Giacinto managed to also score 59 goals in Nerazzurri blue from his left back position, including 12 in the 1965-66 season. Facchetti was the captain of Herrera’s Grande Inter side that won and retained the European Cup in the mid-60’s before losing to Jock Stein’s Celtic side in 1967. Almost a shoe-in because of his impact on the evolution of the game, Facchetti also proved he was a superb player and leader too – captaining Italy 70 times out of 94 caps and winning the country’s only European Championship to date in 1968. Honourable Mentions: Antonio Cabrini, Gianluca Zambrotta. Javier Zanetti is probably the most astonishing example of human stamina in football’s entire history. Signed as a 21-year-old in 1995 from Argentinian side Banfield, “Pupi” has been a constant during a near 20 year stretch, his ability to play anywhere in defence or midfield as impressive as his consistency. Zanetti played mostly as a right back for Inter until the Nerazzurri signed Maicon in 2006, where he became a defensive midfielder. The Argentinian doesn’t pass as well as Falcao, tackle as well as Edgar Davids or strike a ball as well as Marco Tardelli but the veteran’s ability to do all of those things well for nearly two decades at the heart of an Inter side wracked with change during the same period is the reason why his selection is justified. At 39, Javier Zanetti is just as vital for Inter as he was when the Nerazzurri named him captain in 1999 – “Il Tractore(The Tractor)” the driving force of Inter season in, season out. A five-time Serie A Champion including the treble winning season of 2010, Javier Zanetti has won 16 major trophies in 18 years at Inter for 18 different coaches. He is set to break Paolo Maldini’s appearance record while under a contract that will see him at Inter until he is 40, and he will be the first name on the team sheet for whoever is in charge until he decides to hang his boots up – if that ever happens, of course. Honourable Mentions: Falcao, Marco Tardelli, Edgar Davids, Nils Liedholm. Compared to the earlier entries on this list, Michel Platini’s 5 year spell in Turin is dwarfed by his contemporaries in terms of longevity, but that the Frenchman nailed a spot on this list despite being in Italy for a relatively short period of time is emphatic of his magic. Arguably the greatest player of a country blessed with Zinedine Zidane, and arguably the greatest #10 for a club blessed with Roberto Baggio and Alex Del Piero, Michel Platini was both ahead of his time and a throwback to a less frantic age of football - if only because of how simple he made the sport look. To contextualise with a modern parallel, Platini had the passing range of Andrea Pirlo, the first touch of Zinedine Zidane, the awareness of Andres Iniesta and the charisma of James Dean. He was the silky touch on the pitch, and the quotable icon off it. Platini joined Serie A and Juventus in 1982, replacing Irish hero Liam Brady (whose last kick won the Bianconeri the league the season before) but originally struggled to adapt to Italian football, nearly leaving just months after his arrival. However, a more accommodating set of tactics freed the Frenchman who went on to lead Juventus to two league titles in 1984 and 1986 and a European Cup in 1985, Juventus’s first continental triumph. Despite his position in midfield, Platini led Serie A in scoring three seasons in a row and also won an unprecedented hat-trick of Balon D’or trophies, a feat only bettered by Lionel Messi in 2012. Platini’s ability to drop deep to spread the play before pushing forward to join the attack made Michel the perfect midfielder in any formation, meaning he can adopt a roaming role as the orchestrator in my 4-2-3-1, thanks to Javier Zanetti next to him doing the defensive duties of two (or three) men. Honourable Mentions: Andrea Pirlo, Lothar Matthaus, Giovanni Trappatoni, Frank Rijkaard. Venezia: 1939 – 1942, Torino: 1942-1949. Mazzola may seem like a surprise inclusion for some who are unaware of the history of the Grande Torino side of the 1940’s, but a quick look through the history books reveal Mazzola’s inclusion is more than warranted. Played as an attacking midfielder in Torino’s 4-2-4 formation, Mazzola was the best player on a side that dominated Serie A more than any side before or since. Torino own all-time records for consecutive Scudetti, unbeaten home records(four consecutive between 1945 and 1949), the biggest ever Serie A home win(10-0 vs Alessandria in 1947-48), the biggest ever away win (7-0 vs Roma in 1945-46) as well as single season records for goals scored, conceded, points amassed before the 3 point win was invented and a goal per game average of 3.125. It’s an incredible run of success from a team that in a cruel irony was beaten by tragic circumstance rather than a sporting rival – the 1949 Superga aeroplane crash robbing Italian football of a legendary team that could have - and probably would have – continued to dominate for years to come. Mazzola scored 118 goals in just 204 matches for Torino before he died at just 30. His son Sandro went on to become more famous as one of Inter’s greatest ever players in the 60’s and 70’s, but no Serie A XI is complete without a player from Italy’s most endearing, successful and heartbreaking sides. Honourable Mentions: Gianni Rivera, Jose Altafini. I had to fit him in here somewhere, didn’t I? Arguably the greatest player the world has ever seen left Barcelona in 1984 as a 24-year-old and entered himself into the hearts of Neopolitans everywhere, lifting them to their only Scudetti in 1987 and 1990. Maradona became more than a footballer in Naples, embodying the Southern Italian attitude as his own, beating the Northern giants of Milan and Turin on the only medium they could compete – the football pitch. Diego became a social phenomenon, and a saviour. Even today, years after his exploits, murals of the Argentinian can be found in pristine condition throughout the Italian city. Maradona’s effect and hero status during his time in Serie A was such that fans and management ignored Diego’s drug problems, partying and lateness. In fact, by 1990, Maradona barely trained, choosing instead to simply turn up to matches on his own minutes before kick-off. During his peak, Maradona was simply untouchable. His talent was such that Napoli were instantly able to compete with Michel Platini’s Juventus (beating them to a title in 1987), and Arrigo Sacchi’s Milan(beating them to a title in 1990) during a time when Serie A was the undisputed king of world football. His departure began a trophy drought that was only been ended last season, Napoli winning the Coppa Italia after years in the Calcio abyss(that included a spell in Serie C), perhaps doing more than anything else to highlight how much of a difference ‘El Diego’ made to Napoli, and Serie A. Rarely ever has there been a more influential player in a team sport. Honourable Mentions: Zinedine Zidane, Kaka’, Ruud Gullit. Vincenza: 1982-1985, Fiorentina: 1985-1990, Juventus: 1990-1995, AC Milan: 1995-1997, Bologna: 1997-1998, Brescia: 2000-2004. 1) Baggio achieved despite being hampered by coaching disagreements and injury for a large part of his career. 2) Baggio won the Balon D’or in 1993, while Totti was never indisputably the world’s best player. 3) Despite Totti’s superior goals tally – Francesco has 227 goals in 535 games, while Baggio has 205 in 452, giving Il Divino Codino a goals per game advantage of 0.15 (Totti: 1 goal per 2.35 games while Baggio: 1 goal per 2.2 games). Give Baggio Totti’s games and club support, and I’m convinced he’d have scored more. 4) Baggio scored for poorer teams while Totti has been the centrepiece of all of Roma’s activity for 20 years. Baggio, for me, is simply more impressive. There isn’t a player in Italian history more universally loved, respected and admired than Roberto Baggio, who spent a career battling injury and restrictive tactics to score 204 goals in Serie A, and 291 in all competitions. Baggio’s career is probably best remembered by his missed penalty against Brazil in the 1994 final, robbing him of a World Cup his talent richly deserved. But, like that wayward strike in Pasadena in the unforgiving summer heat, Baggio’s career was not built on trophies. It was built on moments. From his 1989 entrance into the Serie A spotlight with his stunning solo effort against Diego Maradona’s Napoli, no less, to his one touch-and-finish goal for Brescia against Juventus in 2004 at the twilight of his career, Baggio entertained Italian football fans the world over with flashes of skill and goals that lived in the memory forever. Perhaps best remembered for his time at Juventus – winning the Balon D’or in 1993 and Serie A in 1995, it was for provincial sides that Baggio often displayed his best work, relishing the freedom given him by the likes of Brescia and Bologna rather than the tactical restrictions from Milan and Inter, two teams unwilling to shape their teams around the mercurial striker. A successful year at Bologna saw Baggio re-join Italy for the 1998 World Cup after an Azzurri exile, and the veteran won a penalty in the opening game against Chile. It was the first he would take for Italy since the famous miss in 1994. Roberto bent over, staring at the ground for several seconds before picking up the ball, laying it on the spot and scoring. It was an exorcism for Baggio, and a reminder to his doubters. Baggio was often dropped later in his international career in favour of younger, or more physical talent; Alex Del Piero, Gianfranco Zola and Christian Vieri all saw starts ahead of Baggio while Marcelo Lippi’s continued benching of the forward meant that he missed out on Euro 2000. Italy lost the final to France after Del Piero, favoured over Baggio, missed several gilt-edged chances to win the game. Baggio continued to be adored by the Italian public, finishing his career with a four year spell at Brescia. His retirement saw an entirely universal response of praise from all corners of Italy, highlighting Baggio’s unique appeal and status among the notoriously territorial Italian football fan. Honourable Mentions: Francesco Totti, Alessandro Del Piero, Sandro Mazzola. Inter: 1927-1940, Milan: 1940-1942, Juventus: 1942-1943, Varese: 1944, Atalanta: 1944-1946, Inter: 1946-1947. The man whose name was lent to the stadium that both Inter and Milan play is a pretty good reason on its own, but Giuseppe Meazza also happens to be a two-time World Cup winning striker who was probably the most dominating in his position in Italian football history. Silvio Piola may have scored more, boasting a formidable 274 Serie A goals to his name, but Meazza could do more than score. An incredible technician, blessed with supreme dribbling and passing ability, Meazza was the complete striker before multi-faceted footballers was a modern trend. Meazza was the first player with personal sponsors, a real bona fide celebrity before the term was commonly coined for sportsmen and anecdotes about Meazza’s career reveal what was a charming, entertaining and very talented rebel. Giuseppe scored bicycle kicks, Maradona style dribbles through the heart of a team and dominated scoring charts in an unforgiving footballing climate, Meazza often having to dodge fouls from players who were keen to avoid humiliation. He could drop deep, he could challenge for headers and famous Italian journalist Gianni Brera even saw Meazza as “the perfect midfielder” due to the completeness of his ability. Joining Milan in 1940 after an injury saw him cry after scoring a goal against beloved Inter in the Milan derby, perhaps becoming the only player in Milanese history to avoid abuse for crossing the footballing divide by virtue of being who he was. Meazza returned to Inter after a six year absence, ending his career in the Nerazzurri colours, finishing with 314 goals in 511 games in all competitions. A case can be made for Marco Van Basten, Andriy Shevchenko, Gigi Riva, Gabriel Batistuta and several other forwards, but none did for as long, as well or as emphatically as Giuseppe Meazza. Buffon; Maldini, Baresi, Scirea, Facchetti; Zanetti, Platini; V.Mazzola, Maradona, Baggio; Meazza. No John Charles in any lists.? Surprisingly wasn't included by the author - however, John was voted in at #21 in our Top 250 players of all-time countdown last year!